•	7 to 8 ounces caramel, either Kraft Caramel Cubes or from a block of Caramel. I used a block of Peter’s Caramel. 1. Before making the cake, line an 18x13x1 inch cookie sheet with foil and spread shredded sweetened coconut evenly over cookie sheet. 2. Bake at 375 degrees F for 10 to 15 minutes, checking and tossing coconut regularly, every 2-5 minutes, to make sure all the coconut gets toasted evenly and does not burn. Coconut is done when it is golden brown. 3. In a large mixing bowl, measure flour and sugar. Set aside. 4. In a medium sauce pan, combine butter, water, cocoa and shortening. Bring to a boil. After mixture reaches a boil, add it to the flour mixture and stir to combine. 5. Add buttermilk, then baking soda, then eggs, then vanilla in that order, mixing in-between each addition. 6. Pour into a greased 18x13x1 inch cookie sheet and bake at 400 degrees F for 20 minutes. 1. In a medium microwave safe bowl, combine butter and milk and bring to a boil. Stir caramel sauce and then add powdered sugar and vanilla and stir until smooth. 2. After cake has cooked, remove from oven and poke holes in hot cake with a fork. Pour frosting evenly over top. 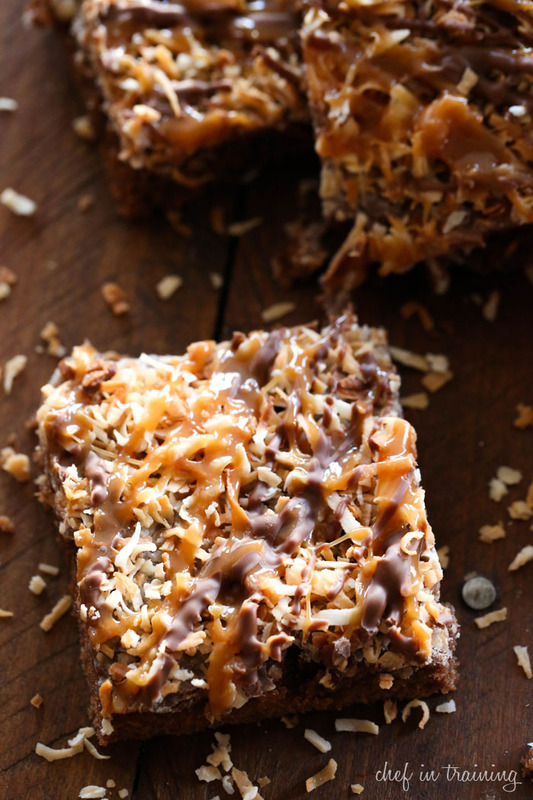 Immediately sprinkle with top of warm frosting with toasted coconut. 3. In microwavable bowl, add caramel and evaporated milk and cook on high in 30 second increments, string in between each increment. Continue to cook and stir until caramel is smooth. Drizzle over coconut. 4. In another microwavable bowl, add chocolate chips and shortening (or oil). Microwave on high in 30 second increments, stirring in between each increment until the chocolate in melted. Drizzle over caramel.